With CAPRICCIO Encore we re-release most famous recordings from the Backcatalogue in a remastered version, new design and for a special price. 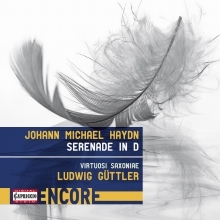 Legendary recordings of artsts like Sandor Végh, Ton Koopman, Sir Neville Marriner or the Vienna Boys’ Choir are also included as special repertoire highlights from the baroque to the contemporary era. In July, 1763 Johann Michael Haydn (1737-1806) arrived in Salzburg and promptly gave a performance at the prince bishop's summertime residential palace. It is noted in the court register that the table music was 'furnished by an outside composer from Vienna by the name of Michael Heiden''. Within a year's time, he had been commissioned to write a serenade. 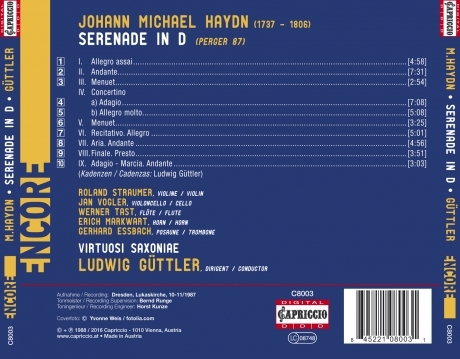 In Salzburg one had high expectations of the composer and newly-named (second) concertmaster Haydn, for it was traditionally the most respected composers of the court who received commissions by the university students to write such serenades. It was a custom in Salzburg to pay respects to the prince bishop at the conclusion of exams, usually in August or early September, by playing a serenade, sometimes called a "Finalmusik".